↑ Fauquet Claude; Fargette Denis (1990). 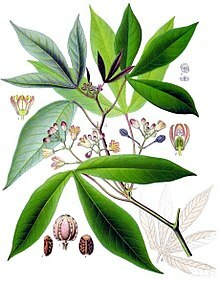 "African Cassava Mosaic Virus: Etiology, Epidemiology, and Control" (PDF). Plant Disease. 74 (6): 404–11. डीओआइ:10.1094/pd-74-0404. ↑ Linley Chiwona-Karltun, Chrissie Katundu, James Ngoma, Felistus Chipungu, Jonathan Mkumbira, Sidney Simukoko, Janice Jiggins (2002) "Bitter cassava and women: an intriguing response to food security", LEISA Magazine, volume 18 Issue 4. Online version accessed on 2009-08-11.